The wrecking balls are the most fearsome runners and dangerous ball-carriers in the game - give these boys the 'pill' and they will leave the opposition defensive line in smithereens. 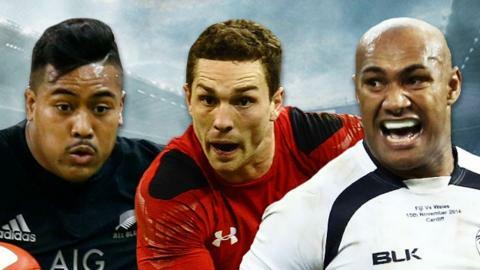 Big, powerful, quick and scary, the class of 2015 follow in the footsteps of the legendary Jonah Lomu as the latest generation of rugby's demolition men. It is hard to pick only six with so many ball-carrying monsters who will be on the rampage over the next six weeks. So how do you rate the half-dozen picked out here, and who do you think deserves to be included? Let us know below. At the age of 23, George North has won 51 caps for Wales, plus three for the Lions, and scored 25 Test tries. Rated by many as the best wing in the northern hemisphere, the Northampton player has recovered after several nasty concussions and will be a major weapon for Wales over the next six weeks. Another of the monster wings set to run riot in the World Cup, Julian Savea has scored a remarkable 30 tries in 35 Tests for New Zealand. As happy running over people as around them, the All Blacks star is now down to his fighting weight after a punishing training regime and must be a serious contender to be the tournament's leading try scorer. He might not have the pace of some of the other wrecking balls, but England number eight Billy Vunipola is one of the best hard-yards men in the game. The 22-year-old, who has won 19 caps, is the heaviest man in the England squad and has the power to match. If Ireland are to get on the front foot, flanker Sean O'Brien will have a major part to play. The Tullow Tank credits his strength to growing up on a farm, and his ability to hammer over the gainline around the fringes makes him one of the World Cup's standout wrecking balls. At first glance he may look like the world's most mobile prop but France powerhouse Mathieu Bastareaud is, despite knocking on for 20 stone, a centre. The sight of 'Basta' wading upfield with several members of the opposition hanging off him is a common one, although his on-pitch menace is countered by a sensitive disposition off it. The mighty Fijian might not have been as well known as some coming into the tournament, but he is a man to be feared. Forget the next-level speed and power, what really makes Nadolo stand out is his footballing skill - as shown by the nine goal kicks out of nine he landed in a warm-up game against Canada. Surely the heaviest goal-kicker in Test history.